SUBIC BAY, Republic of the Philippines - Littoral combat ship USS Fort Worth (LCS 3) arrived here to resupply May 13 after a weeklong routine patrol in international waters and airspace of the South China Sea near the Spratly Islands. 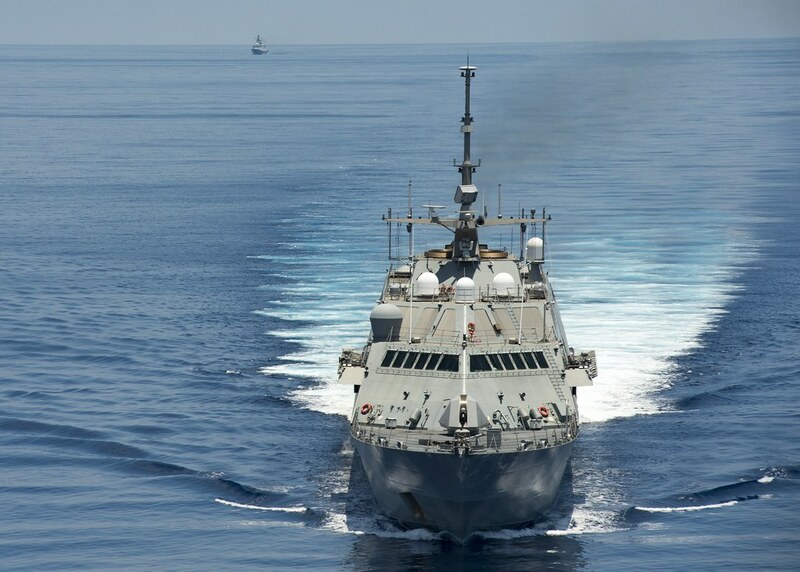 Fort Worth is the second LCS to deploy to U.S. 7th Fleet as part of an initiative to simultaneously deploy up to four LCS to the Indo-Asia-Pacific region in just a few years. The third and fourth LCSs are planned to arrive in 2016, when the region will see two of these ships deployed at the same time. 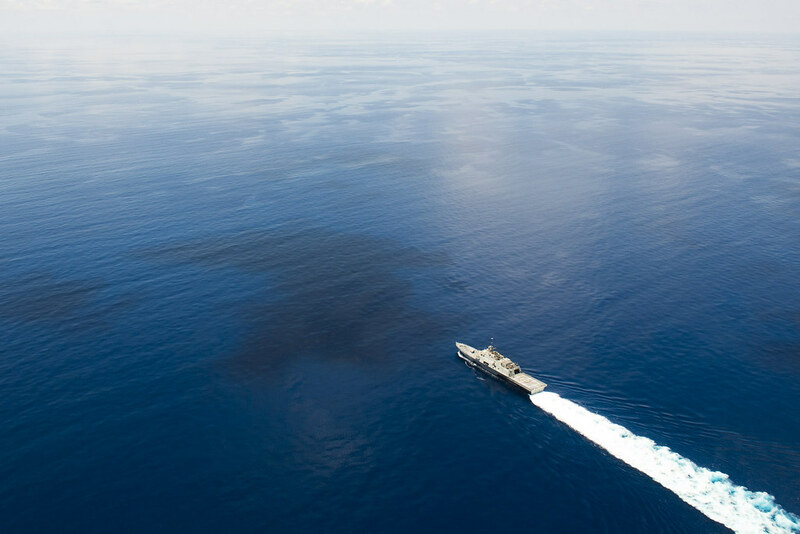 Fort Worth is also the first LCS to deploy under the "3-2-1" manning concept, which allows LCS to sustain a 16-month rotational presence without fatiguing the crew during the extended deployment, which is twice as long as typical U.S. Navy ship deployments. It is named 3-2-1 because three rotational crews will support two LCS ships, one of which is deployed. Future LCS deployments to the region will employ this concept, allowing for enhanced U.S. Navy presence throughout the Indo-Asia-Pacific. While operating in international waters and airspace near the Spratlys, Fort Worth conducted flight operations with its MH-60R Seahawk helicopter. Fort Worth encountered multiple People’s Liberation Army–Navy [PLA(N)] warships, each time taking the opportunity to use the Code for Unplanned Encounters at Sea (CUES). “Just like our first meeting in February with a PLA(N) warship, guided-missile frigate Hengshui (FFG 572), our interactions with Chinese ships continue to be professional and CUES helps clarify intentions and prevent miscommunication,” said Cmdr. Matt Kawas, Fort Worth Crew 103 commanding officer. Following the brief stop for fuel in the Philippines, Fort Worth will return to Singapore for the International Maritime Defense Exhibition and Conference (IMDEX) 2015 just ahead of the second crew swap in late May. Throughout the summer and fall, Fort Worth will take part in most of the 2015 CARAT exercise series. In its 21st year, CARAT is an annual, bilateral exercise series with the U.S. Navy, U.S. Marine Corps and the armed forces of nine partner nations including, Bangladesh, Brunei, Cambodia, Indonesia, Malaysia, the Republic of the Philippines, Singapore, Thailand and Timor-Leste. During February and March, Fort Worth participated in the annual U.S.-Republic of Korea exercise Foal Eagle and conducted a maintenance availability in Sasebo, Japan, expanding LCS’ operational reach to Northeast Asia for the first time. Following the availability, Fort Worth returned to Southeast Asia where she took part in the sixth-annual Naval Engagement (NEA) Vietnam with the Vietnam People’s Navy (VPN) in April, spending a day operating at-sea with the VPN. Fast, agile and mission-focused, littoral combat ships are designed to operate in near-shore environments and employ modular mission packages that can be configured for surface warfare, mine countermeasures or anti-submarine warfare. Fort Worth will employ the surface warfare (SUW) mission package for her entire deployment, augmenting her 57mm gun and rolling airframe missile launcher with two 30mm guns, two 11-meter rigid-hull inflatable boats, and two six-member maritime security boarding teams. Enhancing the SUW mission package is the embarked aviation detachment from Helicopter Maritime Squadron (HSM) 35, the Navy's first composite expeditionary helicopter squadron, which consists of one Sea Hawk helicopter and one Fire Scout.